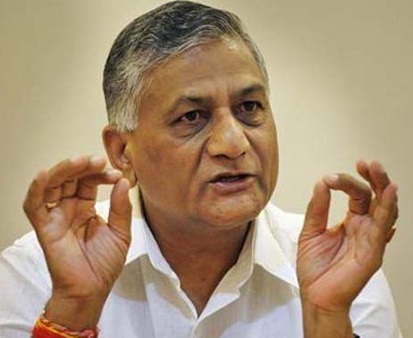 Union minister General VK Singh has said that people should raise voice against caste-based reservations, if they want them to be scrapped. Singh said this in Unnao in poll-bound Uttar Pradesh. "Whether the system (quota for weaker sections) has to remain in place or changed, this decision has to be taken by people", he said. Singh further said that if people want reservations to go, then they should speak up against reservations in government jobs, reported Dainik Jagran. Quotas is a sensitive issue in India. Earlier, BJP had lost the election in Bihar after RSS chief Mohan Bhagwat's comment suggesting that reservation could be scrapped and caste-based quotas could be reviewed. Though BJP supports caste-based reservations publicly, there is a section within the party that doesn't like quotas for Dalits, Tribals and OBCs. BJP's support base is the Savarnas or Upper caste but in order to broaden its base, it has been taking up a pro-reservation line. The Union minister of state for external affairs was in UP during the Parivartan Yatra. On demonetization, he said that Prime Minister had sought 50 days time from the people and one should wait for the period to be over.